It’s that time of year again — the time when I give something back to you folks, literally. Or, if you prefer to be more cynical, the time when I clear out all the uni-related stuff that’s accumulated in my apartment over the past year. Either way, it’s the day I run a big raffle that all of you can enter. As in past years, some of you may recognize a few of these items as gifts that you thoughtfully sent my way over the past 12 months. I realize regifting may seem tacky, but sometimes I have duplicates on certain things, or I don’t have room for everything, or something is too big or too small for me to wear, or I’ve gotten some enjoyment out of an item and am now ready to let someone else enjoy it. No offense intended, and I hope none taken. Thanks for understanding. The listings that follow are pretty self-explanatory, except for this: For shirts and jerseys, you’ll see a size followed by two measurements (L, 21″, 29″). In each case, that’s the tagged size followed by the pit-to-pit measurement across the chest and the length from the back collar to the bottom hem. 1. A complimentary Uni Watch membership card with your choice of design. 2. 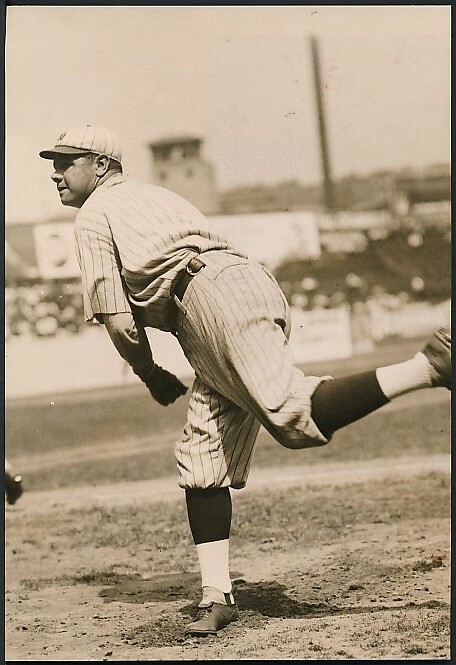 An MLB Ballpark Pass-Port, like the one described here. 3. A genuine leather wallet with a lining made from a swatch of game-used uniform fabric. You can choose from any of these MLB, NFL, or NHL teams, with a value of up to $160. 4. A Green Bay Packers blanket like the one shown here. 60″ x 72″. 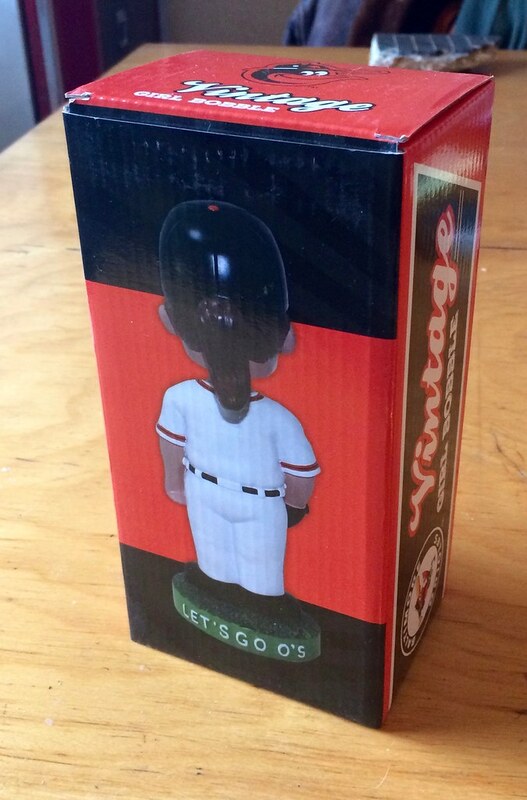 This one is pretty heavy, so it would be nice if the winner could chip in to help with the shipping costs. 5. A 2017 Ohio State calendar from Asgard Press. 6. Same as above, but for Texas. 7. Same as above, but for Alabama. 8. A 2017 Electric Football calendar from our friends at the Unforgettable Buzz. 9. 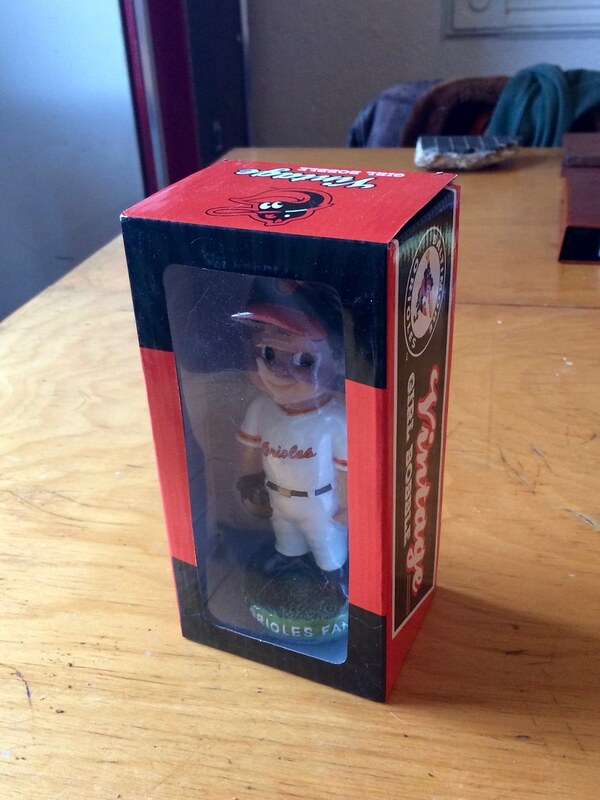 An Orioles “vintage girl” bobble, still in the box. Has ponytail in the back. 10. 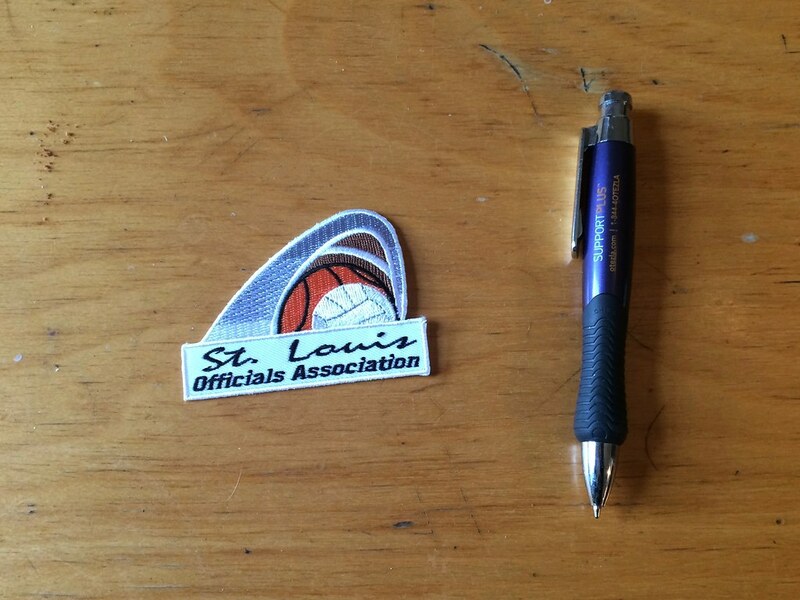 A St. Louis Officials Association patch. Pen, shown for scale, not included. 11. 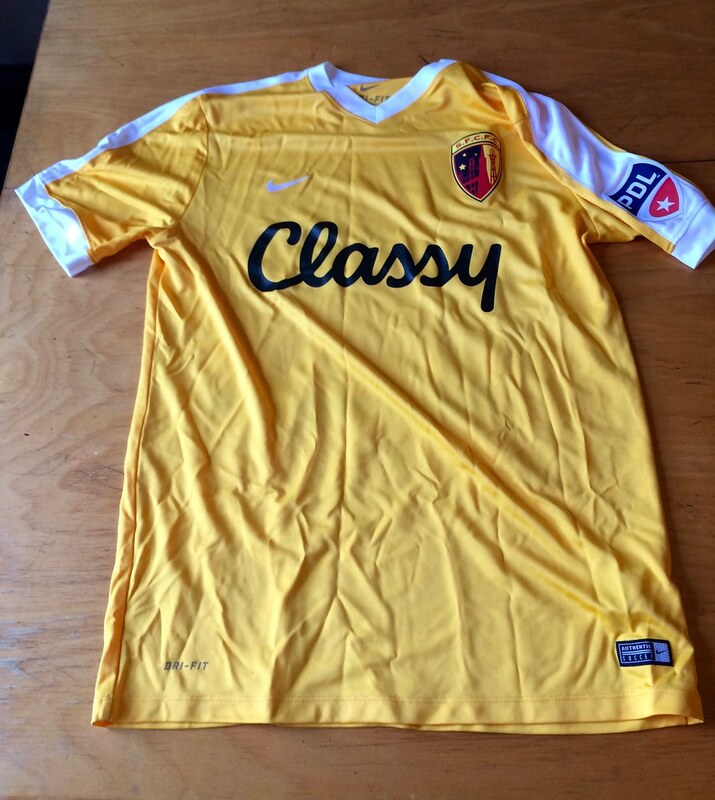 A San Francisco City FC jersey. Annoying ad on the back. L, 20.5″, 29.5″. 12. 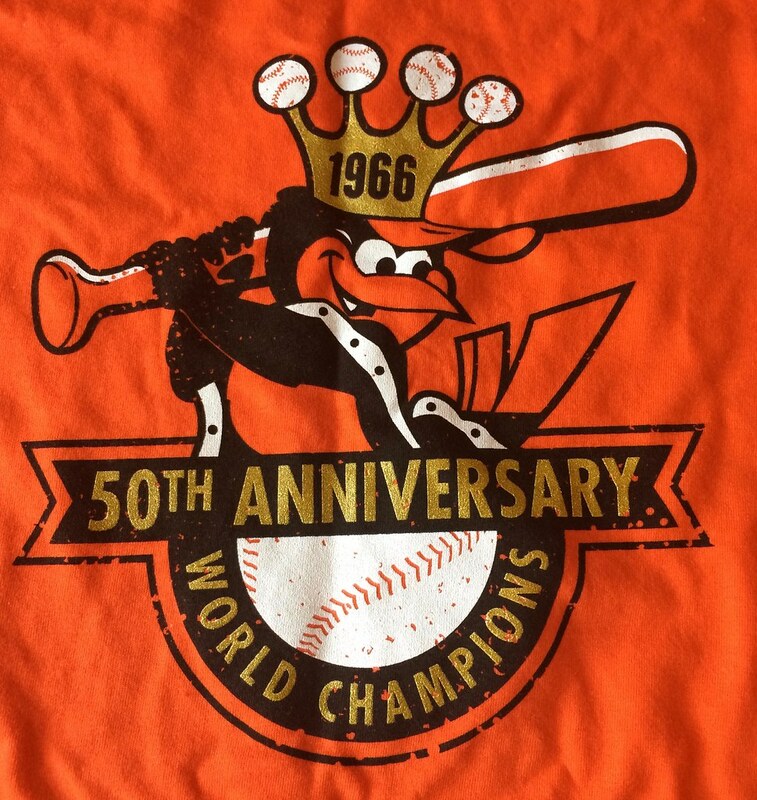 A T-shirt celebrating the 50th anniversary of the Orioles’ 1966 championship. Chest logo is a bit spotty. M, 19.5″, 27″. 13. 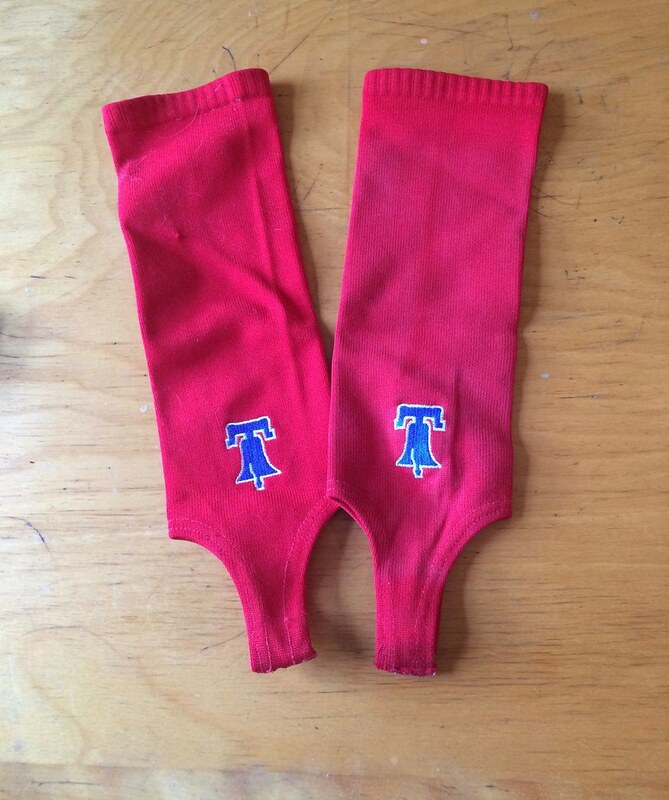 A pair of Phillies Liberty Bell stirrups. 14. 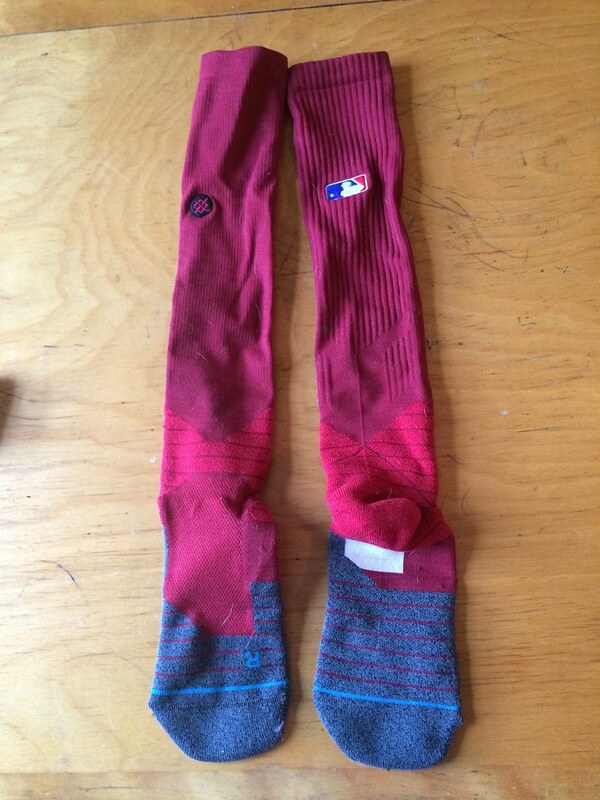 A pair of Stance-made Phillies socks. MLB logo and Stance logo both appear on both socks. 15. 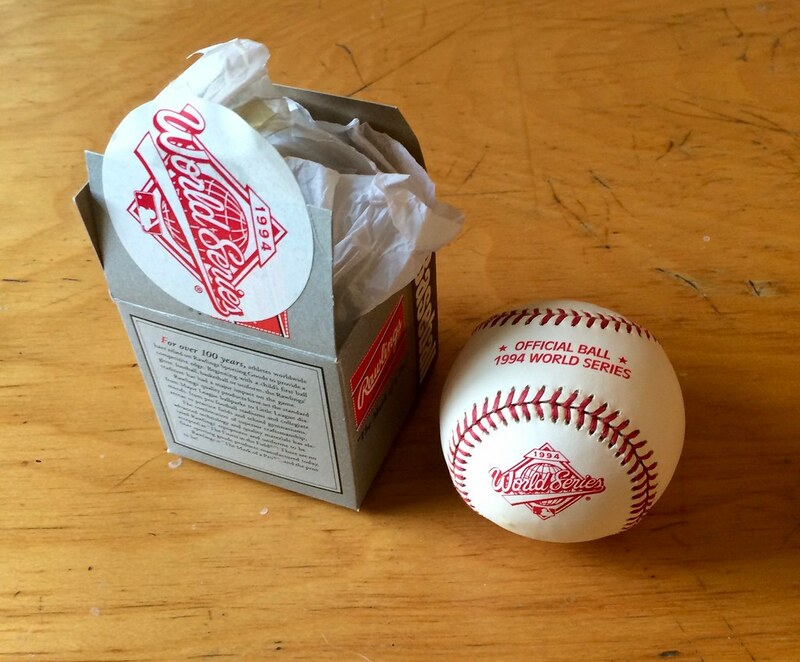 A phantom baseball from the 1994 World Series, which was wiped out by labor strife. 16. A Professional Bull Riding jersey. 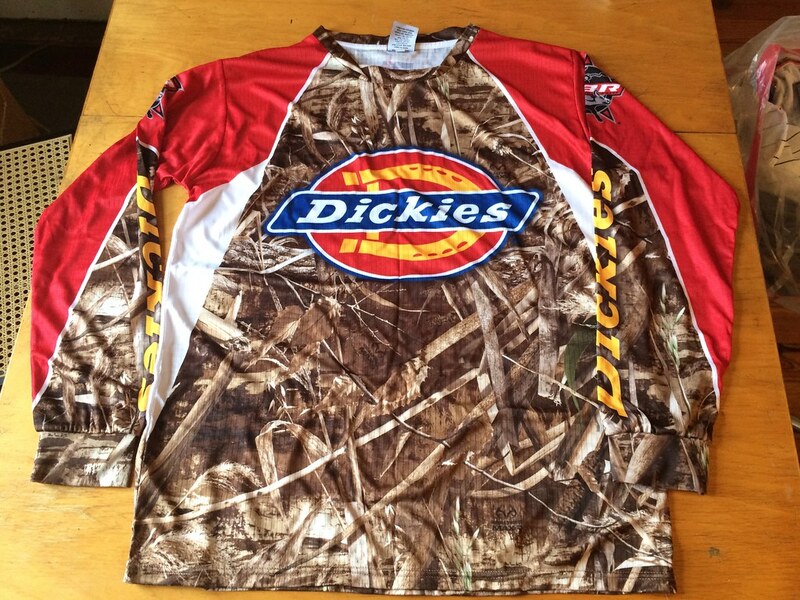 Dickies branding on the front is nothing compared to what’s on the back. M, 23″, 29″. 17. 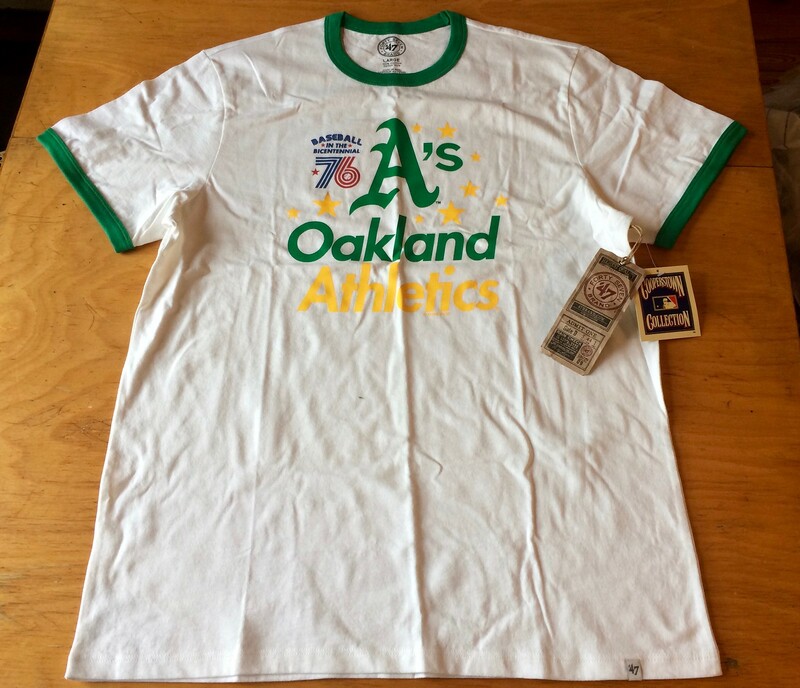 An A’s ringer tee. L, 22″, 29″. 18. 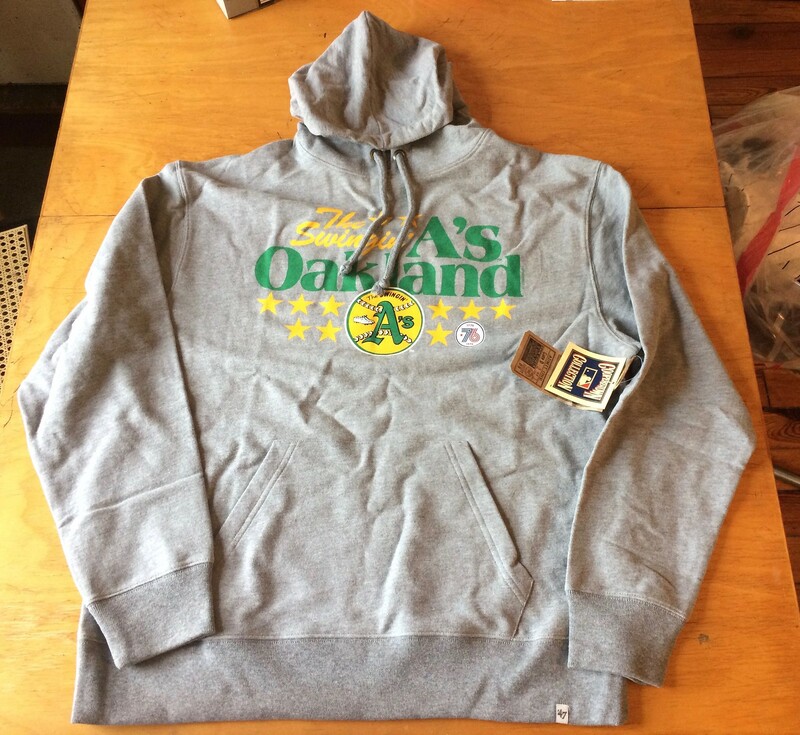 An A’s hooded sweatshirt. L, 24.5″, 29″. 19. 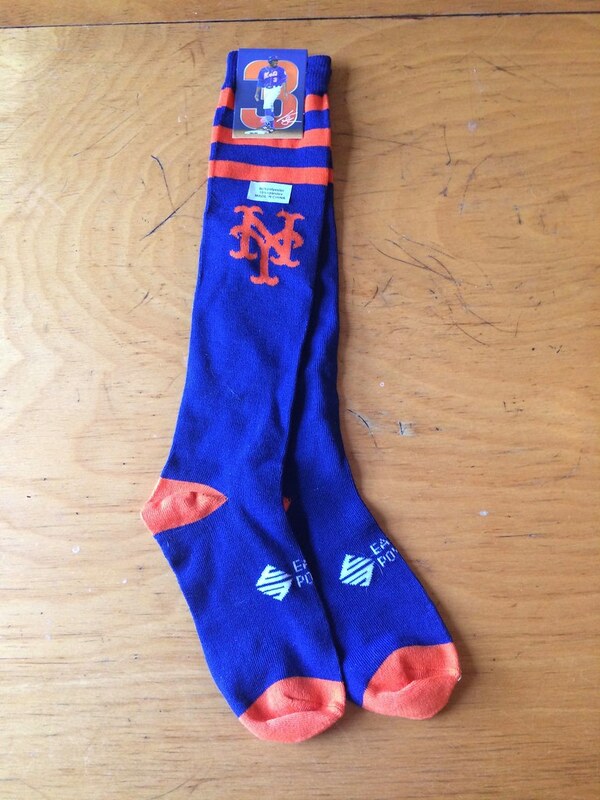 A pair of Curtis Granderson giveaway socks. 20. 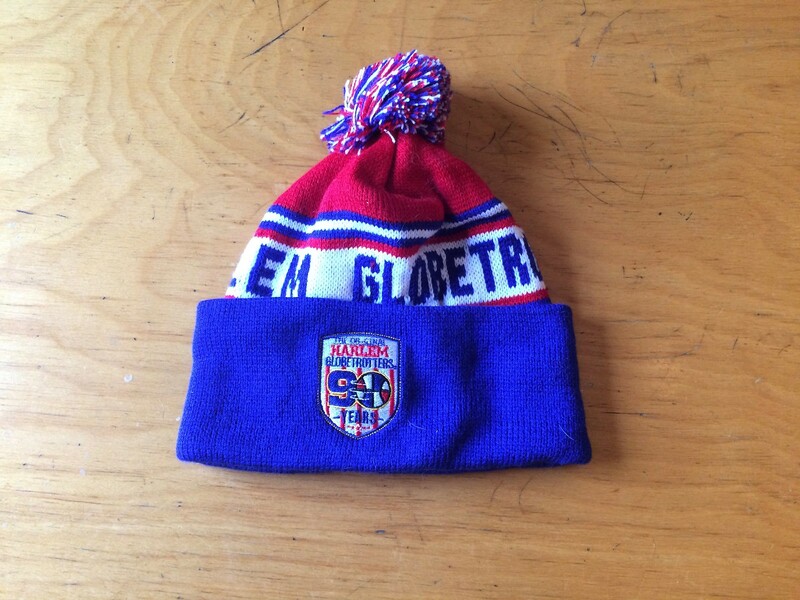 A Harlem Globetrotters 90th-anniversary pom-pom hat. 21. A pair of striped Pacers socks. Dark sections are more navy-ish than the photo indicates. NBA logo and Stance logo both appear on both socks. 22. 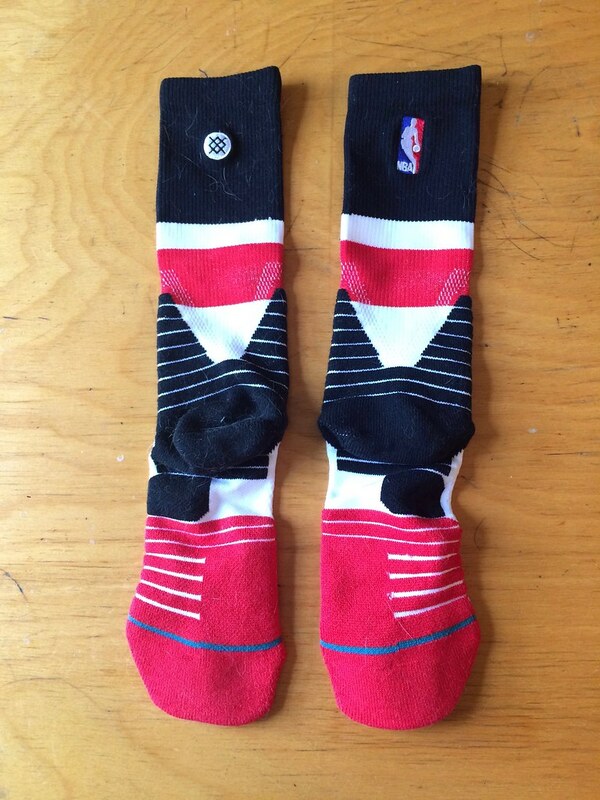 A pair of NBA striped crew socks. Not sure which team they’re for — Trail Blazers, maybe..? 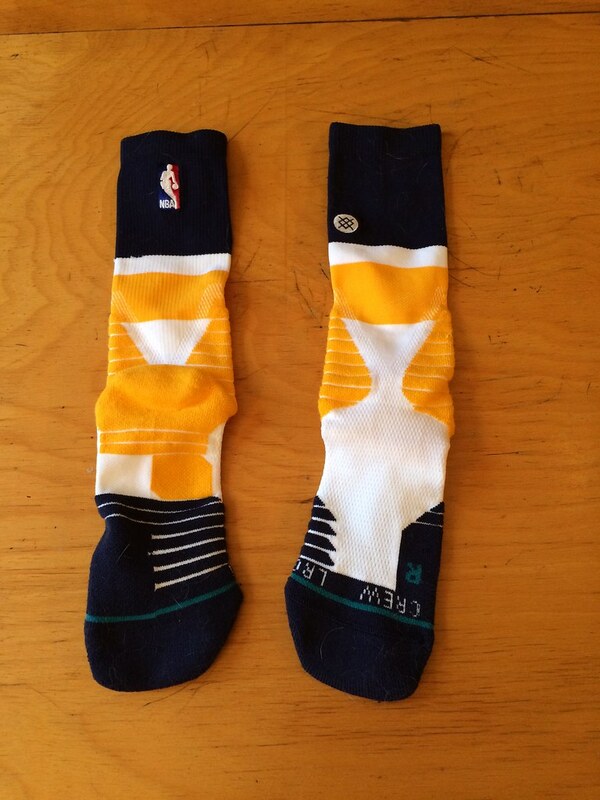 NBA logo and Stance logo both appear on both socks. 23. 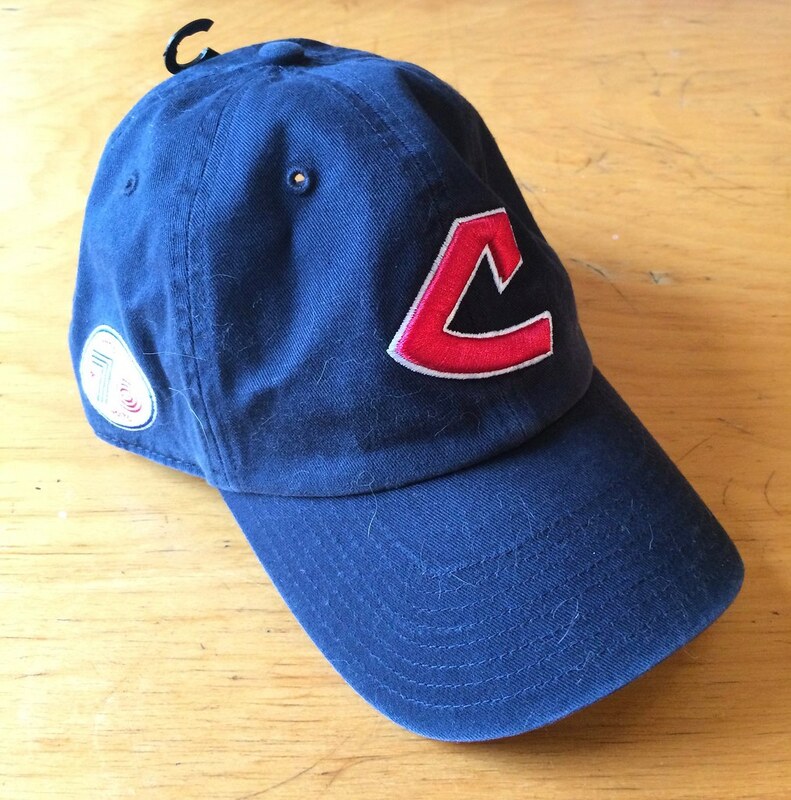 An Indians crooked-C strapback cap. 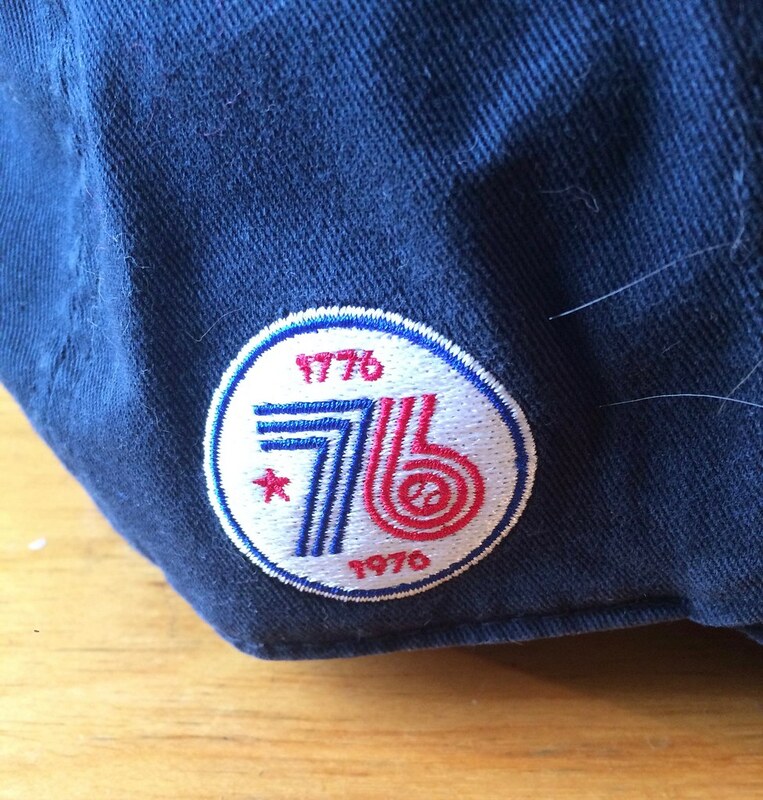 Bicentennial logo on one side, ’47 logo on the other. 24. 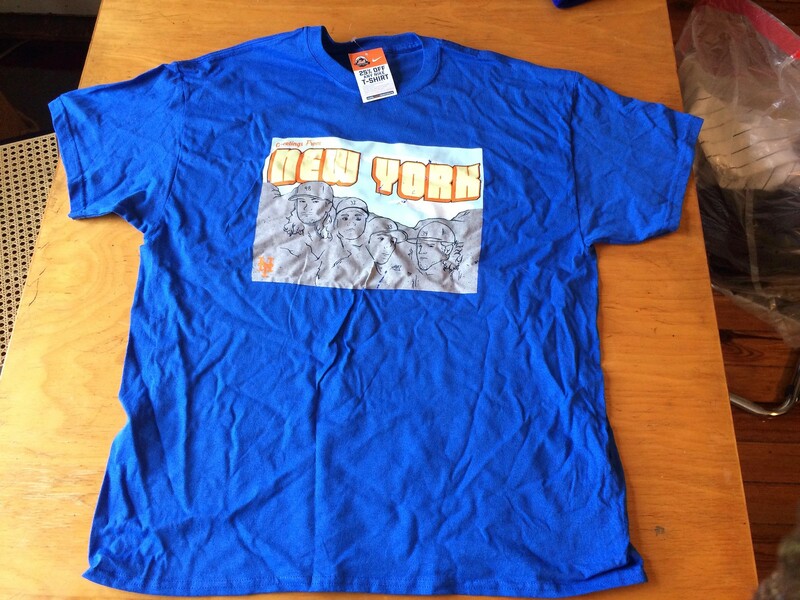 A “Mets Rushmore” giveaway T-shirt featuring pitchers who mostly ended the year on the DL. Annoying ad on the back. XL, 23.5″, 29″. 25. 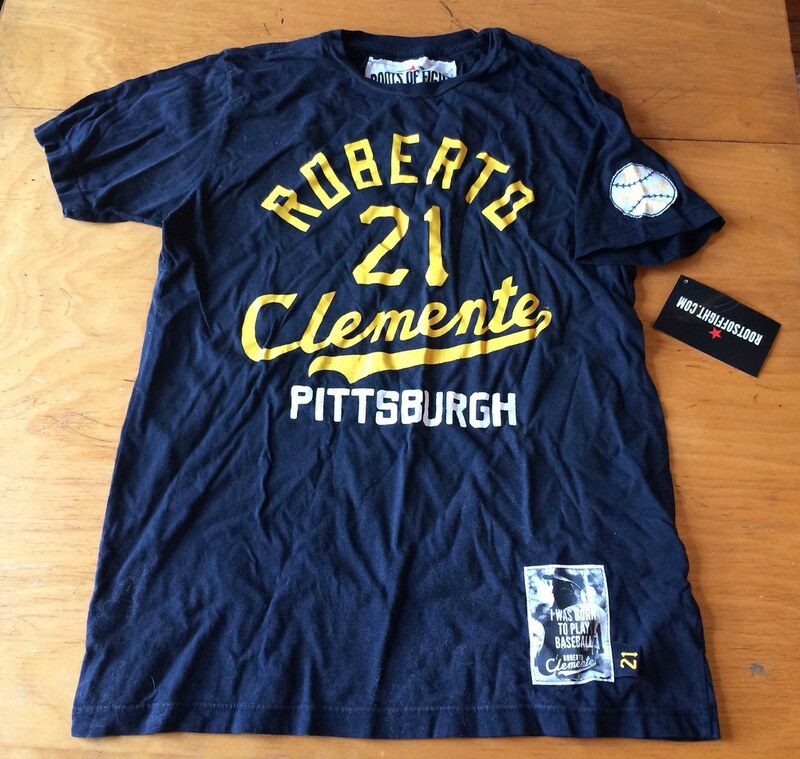 A Roberto Clemente T-shirt. M, 20″, 27″. 26. 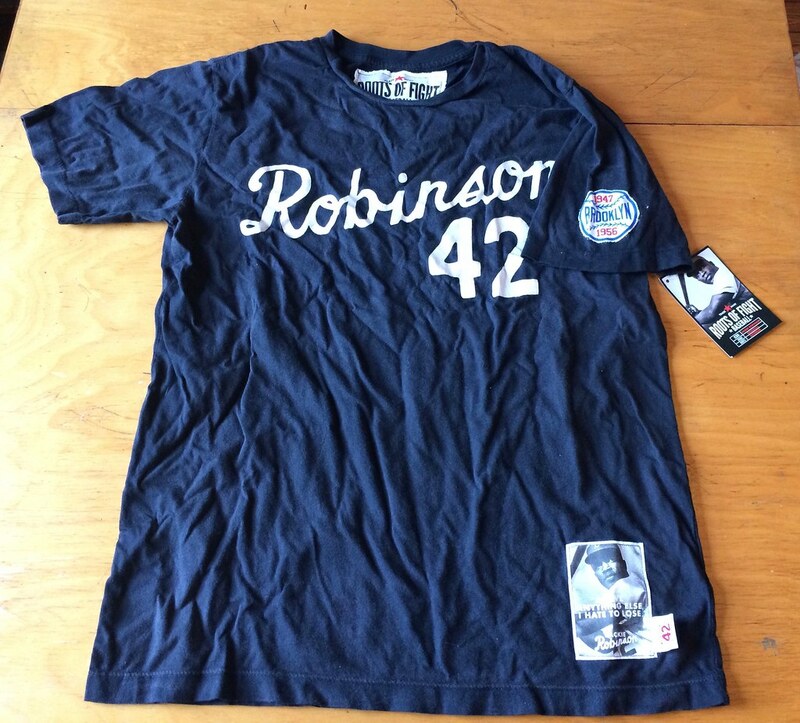 A Jackie Robinson T-shirt, featuring a color that Robinson never actually wore. M, 20″, 26″. 27 and 28. Two copies of the book St. Louis Cardinals Uniforms and Logos: An Illustrated History. Each copy is a separate prize. 29. 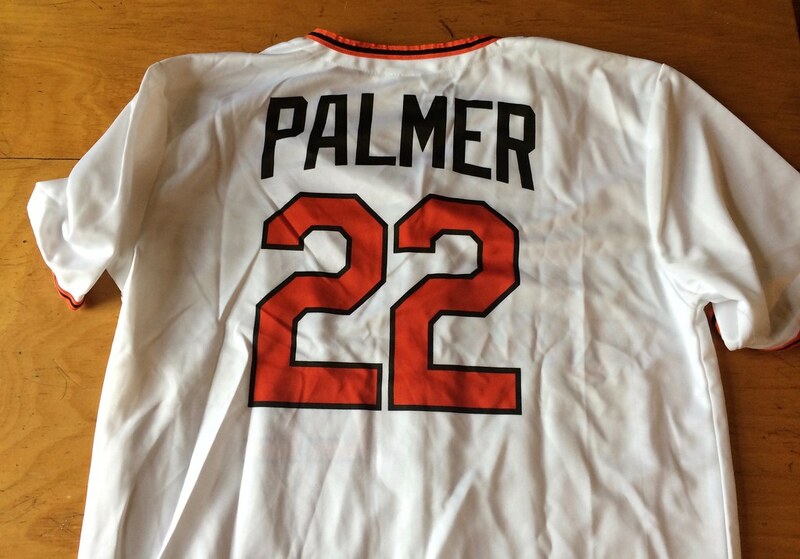 An Orioles giveaway jersey with “Palmer 22” on the back. 30. 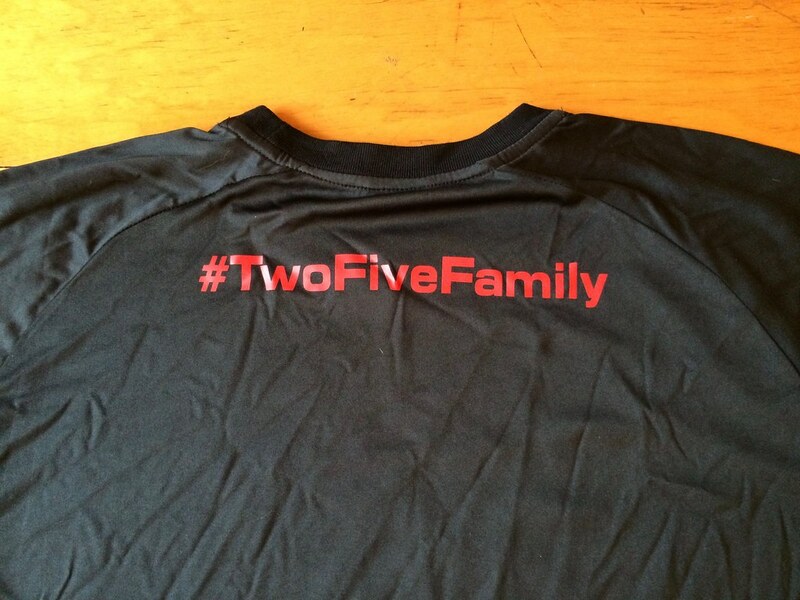 A Two Five Apparel dri-fit T-shirt. Whisper weight. 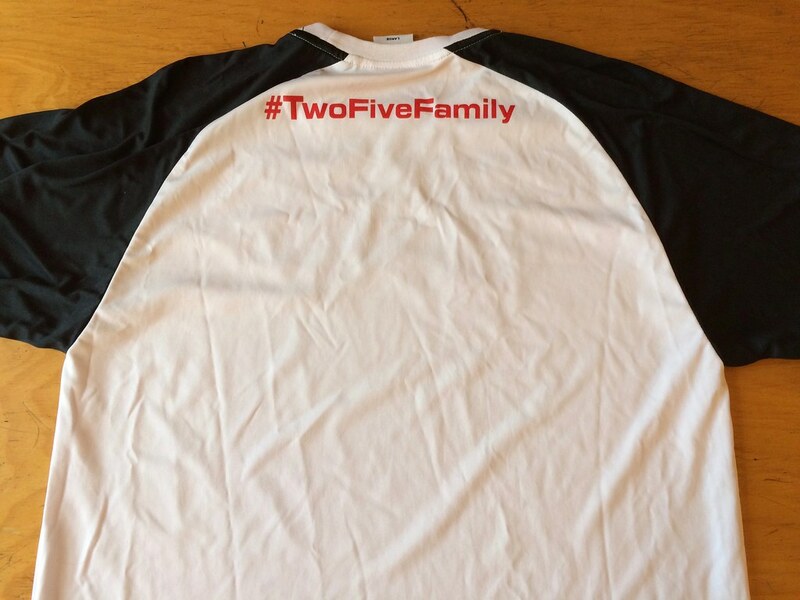 Hashtag on back. L, 21.5″, 27.5″. 31. 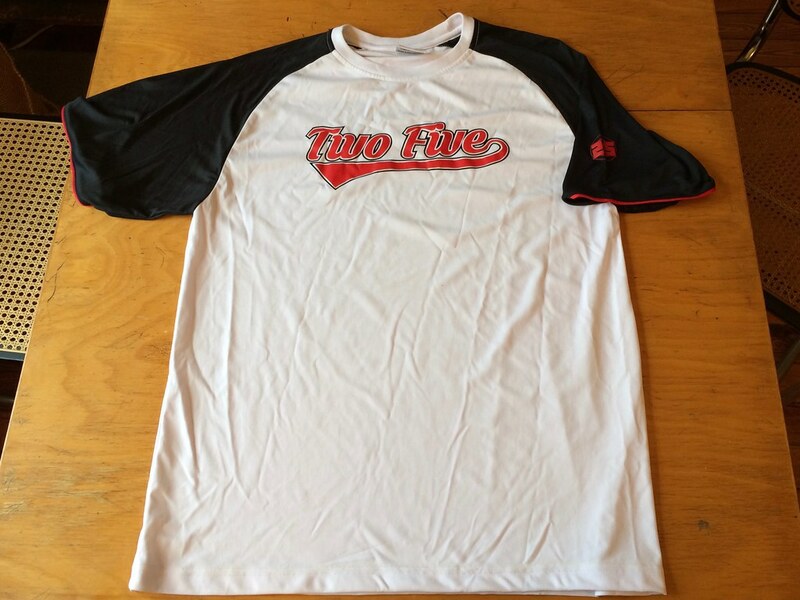 Another Two Five dri-fit tee, but with a completely different design. 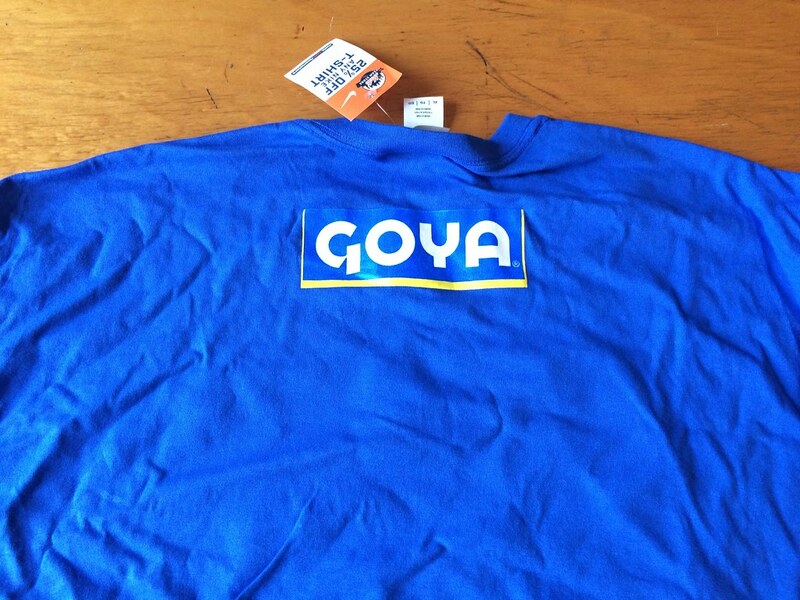 Hashtag on back. L, 21″, 28″. 32. 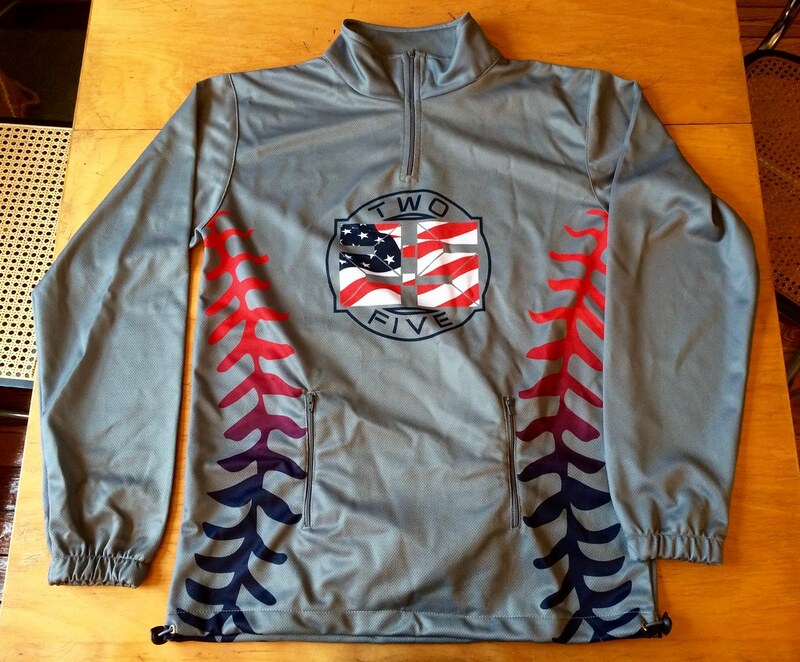 A Two Five thermal pullover. 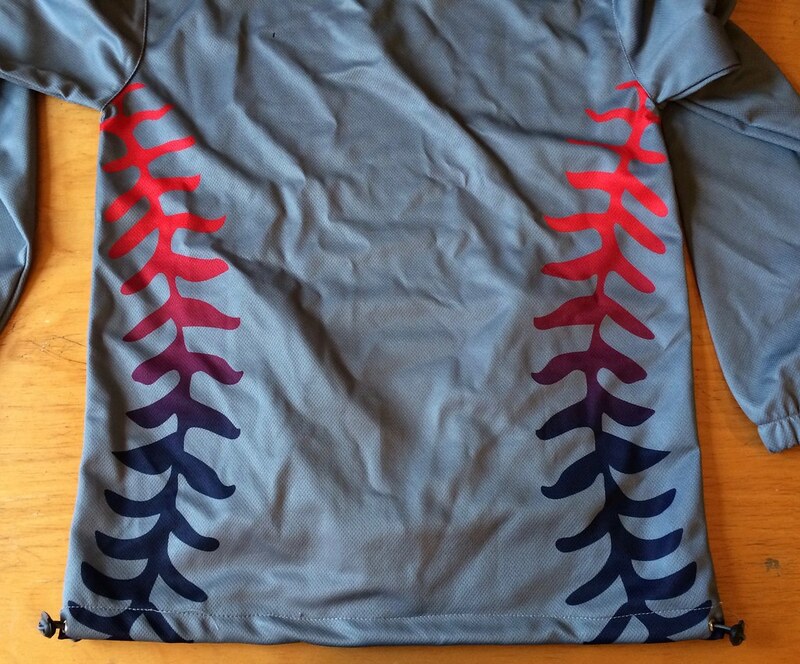 Baseball seam pattern on back. M, 20.5″, 27.5″. 33. Same as above, but in a larger size: XL, 24.5″, 29.5″. 34. 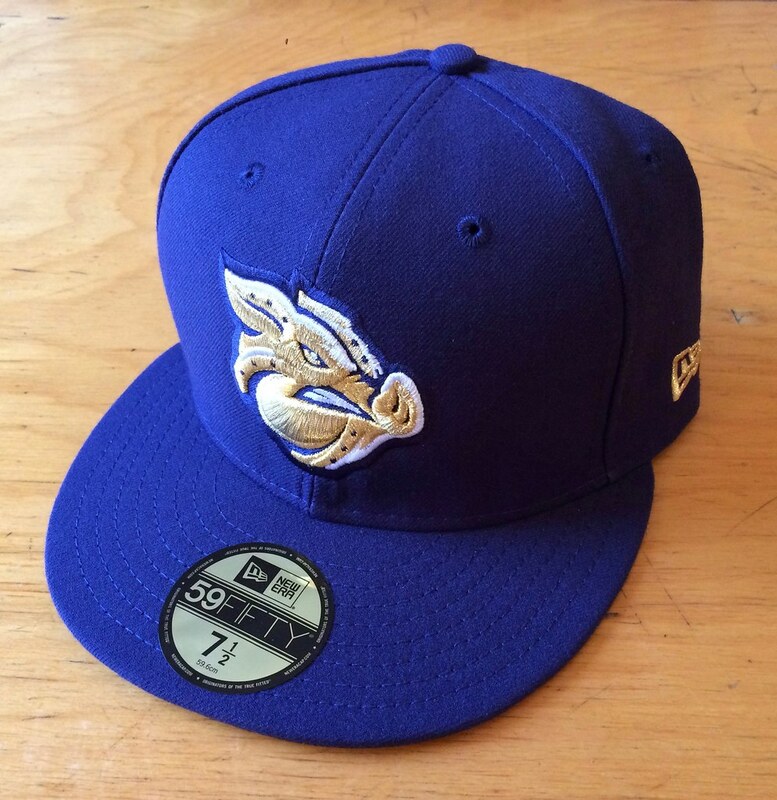 A Lehigh Valley IronPigs cap. Size 7.5. 35. 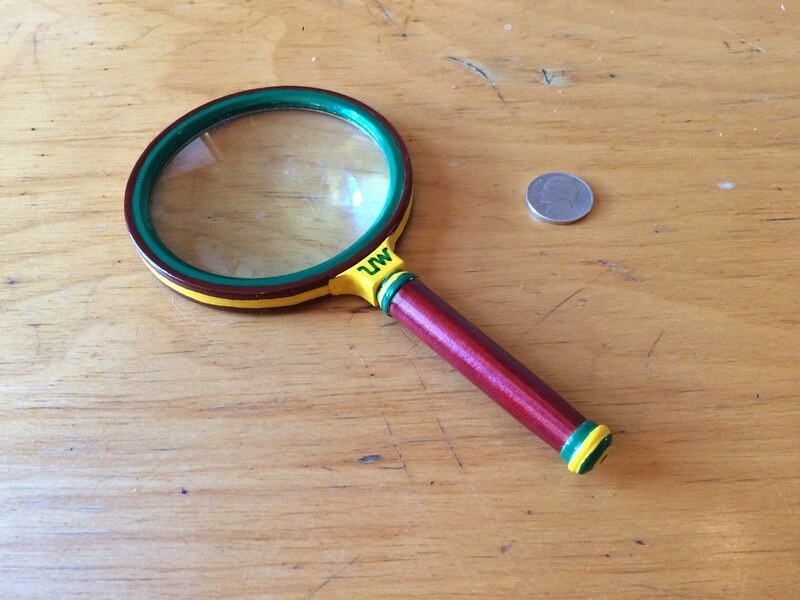 A Uni Watch magnifying glass, symbolizing how UW takes a close look at the uni-verse. Hand-painted by longtime reader Ben Traxel. Nickel, shown for scale, not included. 36. A pair of Oklahoma City Hornets sneakers, dating back to when the franchise temporarily relocated to OKC following Hurricane Katrina. Lots of small details, including NBA logo aglets! Size 11.5. 1) Send an email to the raffle address. If you’re having any trouble with the link, it’s uniwatchraffle at gmail dot com. 2) In the body of the email, please indicate (a) your name and shipping address and (b) your top 10 prize choices, in order of preference, by number. If you’re only interested in, say, seven items, then just list your top seven choices; if you want to list more than 10, you can do that too, but I don’t really expect anyone to go that far. I’ll do my best to accommodate all the winners’ choices. 3) One email per person. Overseas readers are welcome to enter, although I may ask you to chip in on the shipping charges if you win something heavy. Entry deadline is next Wednesday, Dec. 21, 7pm Eastern. The winners will be announced on Christmas Day. Again, my thanks to all of you who contribute in various ways to Uni Watch. I wish I could provide gifts for all of you ”” honest. 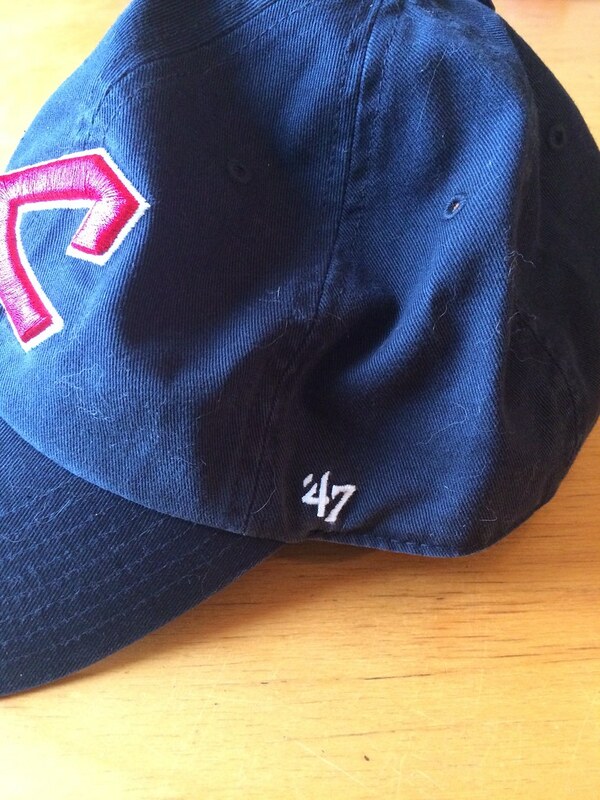 • It is true that Cleveland will no longer wear the Wahoo caps with the navy alternate jerseys at home. For navy-clad home games, the team will wear the red block-C caps that had previously been paired with the cream alternates (which are now being eliminated). • During the World Series, MLB commish Rob Manfred expressed a desire to meet with team ownership regarding Wahoo at some point during the offseason. But that meeting has not yet taken place or even been scheduled, and the home/navy cap change has nothing to do with Manfred. The cap switcheroo for 2017 had already been decided upon well prior to the 2016 postseason and was already noted in the MLB Style Guide. I got all of this straight from the team’s senior spokesperson, who I spoke with yesterday afternoon (and then contacted again last night after a Cleveland TV station posted a report that turned out to be erroneous). Believe it. Yesterday morning Tony posted the latest installment of “Maakies” (shown above), which has Uncle Gabby blowing Drinky Crow’s brains out. There’s nothing unusual about that — Drinky Crow getting shot in the head was the strip’s longest-running gag — but this one felt different. The line “Drinky Crow, it’s time…” made me think Tony might be getting ready to close up shop. A few minutes later my hunch was confirmed, as Tony announced that the strip is ending. The truth is, it was time, because “Maakies” was no longer as reliably wonderful in recent years as it had once been. Still, I mourn its passing. At its best, it was sad, caustic, hilarious, beautiful, clever, absurdist, joyous, depressing, and redemptive in equal measure. Its running theme was what Tony liked to call “the horror of being alive,” and how the chief palliatives to that horror are love and alcohol (not always in that order). If the strip’s quality has dropped off a bit lately, I’d like to think it’s because Tony’s internal horror has lessened as well, and that he therefore no longer has such potent source material to draw from. Or at least I hope that’s the case. I know Tony will move on to other triumphs, but this still feels like the end of an era. Good-bye, Uncle Gabby and Drinky Crow — R.I.P. NFL & College Football News: Seahawks coach Pete Carroll will wear these black-and-lime green shoes for tonight’s Color Rush game (from Brinke). … Matthew Stafford wore a single-finger glove on his throwing hand in practice yesterday. The Lions QB dislocated his middle finger against the Bears on Sunday, but finished the game wearing a regular glove. … Air Force has added Fighter Squadron Patch decals to its helmets for the Arizona Bowl later this month (from Phil). Hockey News: During a recent Wisconsin-Michigan game, ESPN placed a bug for #cawlidgehawkey in the corner of the screen. The phrase, meant to sound like a Boston accent, comes from the movie Miracle, and the hashtag was made popular by ESPN’s John Buccigross (from Dustin Semore). … The teams are Moorhead High School in Minnesota are called the Spuds, and fans often throw potatoes onto the ice, even after they’ve been warned not to do so. A recent spud-tossing incident resulted in a penalty being called against Moorhead, which in turn resulted in a spud-related power play goal for the opposing team. “No, this is not fake news,” says Chris Murphy. NBA News: Rip Hamilton wore Jordans early in his NBA career when he was with the Wizards. He says that Michael Jordan gave him a hard time about it, saying that his namesake shoes were “for All-Stars.” Hamilton was traded to Detroit and ended up making four All-Star teams. 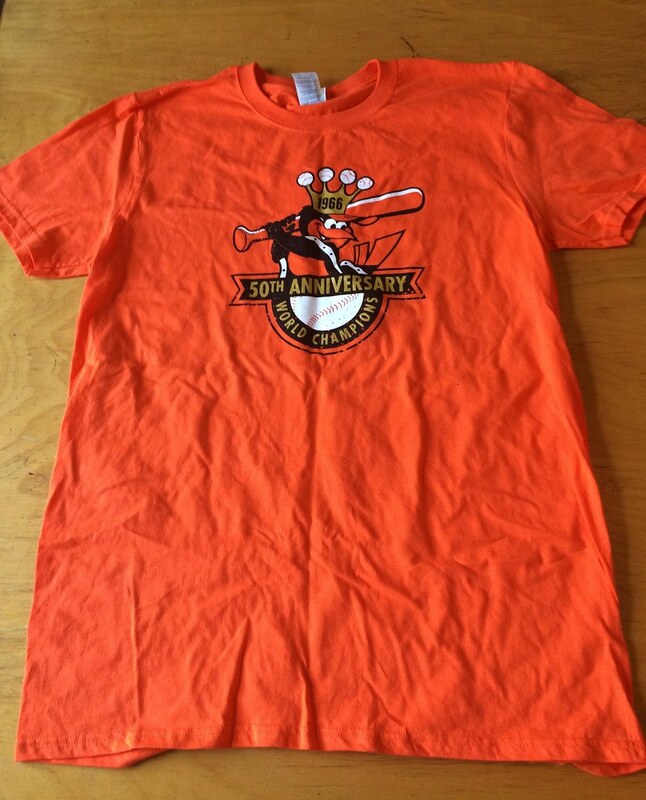 … The Blazers offer a ticket package that includes a bag of coffee and mugs with the old logo on them. Soccer News: Premier League clubs are looking to earn big bucks from sleeve patch ads on their jerseys. 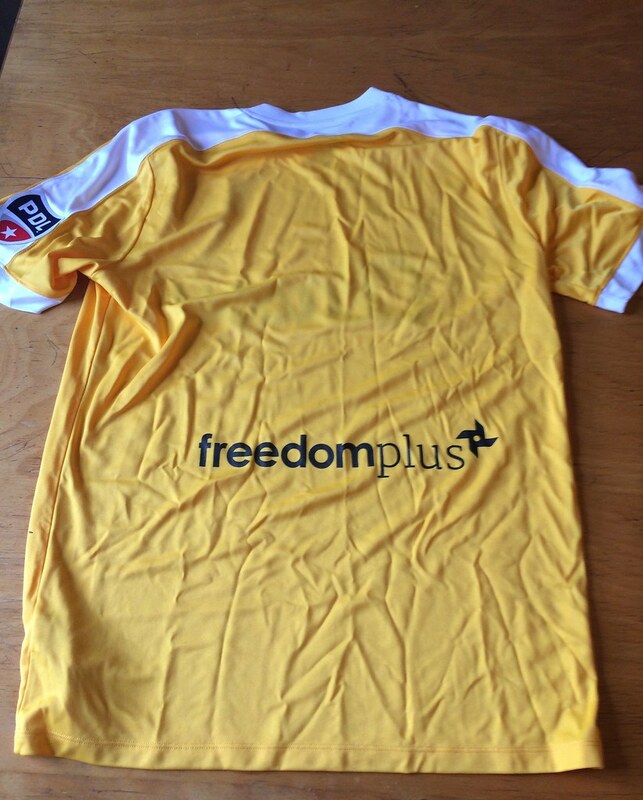 The league had previously held out on sleeve ads under the belief “that broadcasters would pay more for the rights to televise a ‘clean’ product with limited shirt branding.” … Airdrieonians, a Scottish club, will pay tribute to a fan who died from cancer by wearing jerseys with his face on the front for the rest of the season (from @the_boot_room). … New home and away kits for Senegal (from Trevor Williams). 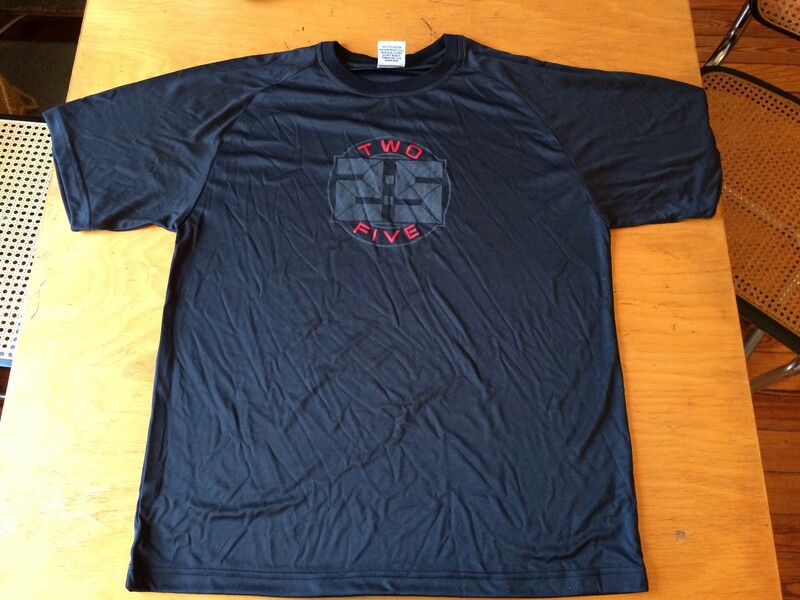 … Also from Trevor: In the early 1990s, Grasshopper Club ZÃ¼rich wore jerseys with “Why Drugs?” on the front and “No Drugs” as the NOB. “Reminds me of West Brom’s anti-smoking shirt from 1984-86,” he says. 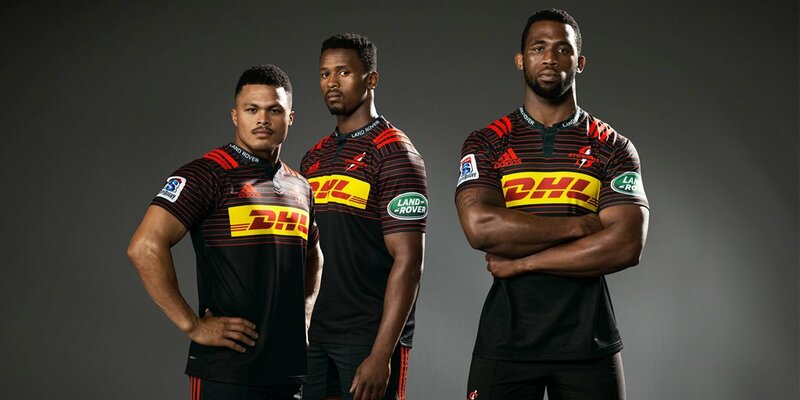 Grab Bag: New away jerseys for the Stormers, a South African Super Rugby team. “Their colors are dark blue and white, which makes these jerseys stupid,” says Eric Bangeman. Typo: the sneakers in item 36 are for the Oklahoma City Hornets; the Thunder are the former Seattle SuperSonics. probably not on anyone’s radar, but it feels like Bucknell is slowly trying to change their logo to the forward facing bison they have on their sports webpage. The university doesn’t acknowledge it at all, but it has been showing up on uniforms and their lacrosse helmets for a couple seasons now and on a lot of their bookstore merchandise. Personally, I like it better than their old logo and wish they would go forward with it completely. Many thanks to Paul (and team) for the hours of enjoyment throughout the year. There are probably quite a few of us who are grateful to discover that there are more people “just like us” in the uni-verse, regarding the obsession about unis. BTW -“REGIFTING” occurs when the cheese basket you received at the office is taken to a neighborhood holiday block party at the end of the week. Paul’s offer is more like sharing, re-cycling, re-enjoying. Noone in the uni-verse should feel bad about receiving one of Paul’s year-end goodies, as there is full disclosure up front. Hear hear to Jerry’s words of gratitude! I love the annual recycling raffle. Not in any hopes of wining stuff, but for the list itself. What gems! What interesting stories most of them suggest about themselves or how they ended up at UW HQ. 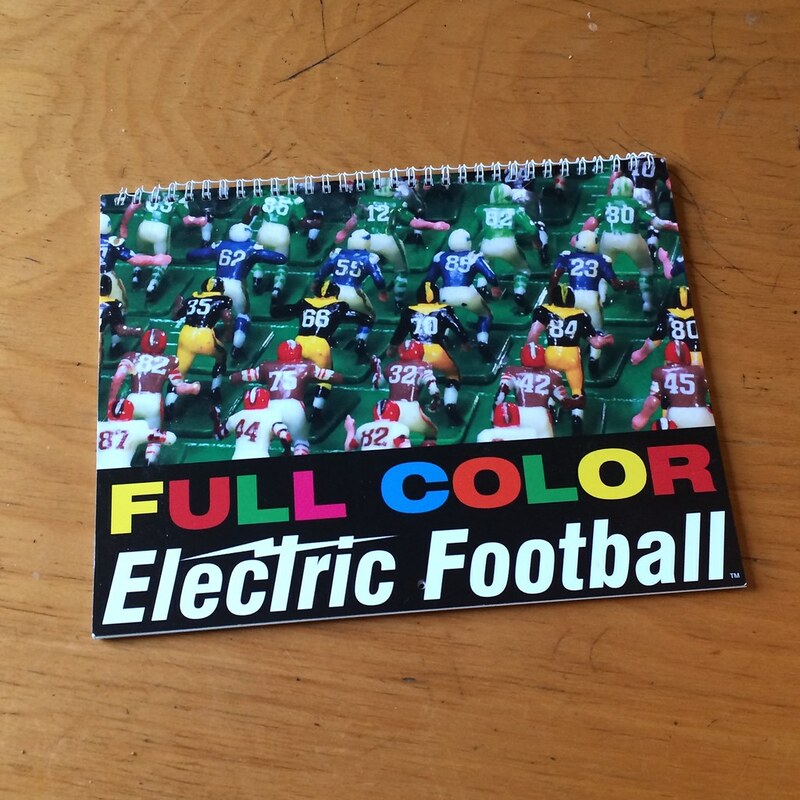 For example, there’s an electric football calendar? For 2017? How wonderful is that! There’s also gag re-gifting. I have some friends who give each other the same coffee pot each birthday. Years ago – maybe circa 1988? – I saw a local TV report about a couple of brothers who did the same thing, plus Bond-villain levels of escalating insanity. I think the unwanted gift they kept swapping was a pair of bluejeans, and the exchange I remember from the report involved the gifting brother stuffing the jeans into the glove compartment of a junker car, then having the car crushed into a cube, and trucking that to his brother’s lawn. Brothers in law Larry Kunkel and Roy Collette exchanged a pair of yellow mohair trousers. It ran from the 1960s until 1989 when the pants were burned while they were being prepared for another exchange. 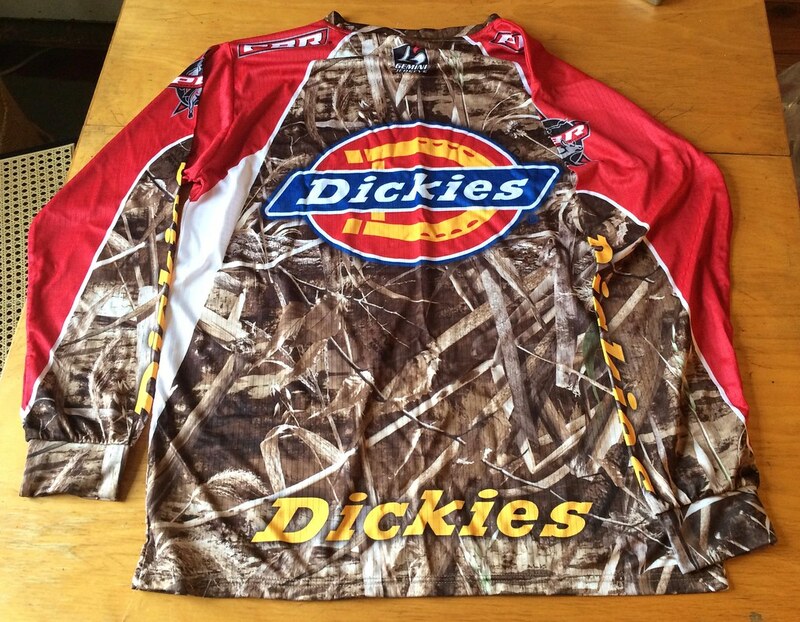 Asking for a friend…How does a Brooklyn guy like yourself come across a professional Bull Riding jersey? I honestly don’t remember, but it was presumably a freebie from PBR (the organization, not the brewery), or from Dickies, or something like that. That one went straight into the large trash bag of year-end raffle stuff that lives under my bed. Is anybody else having trouble logging into that email raffle address, or am I again technology challenged? And, I really had my eye on some great gifts to myself. 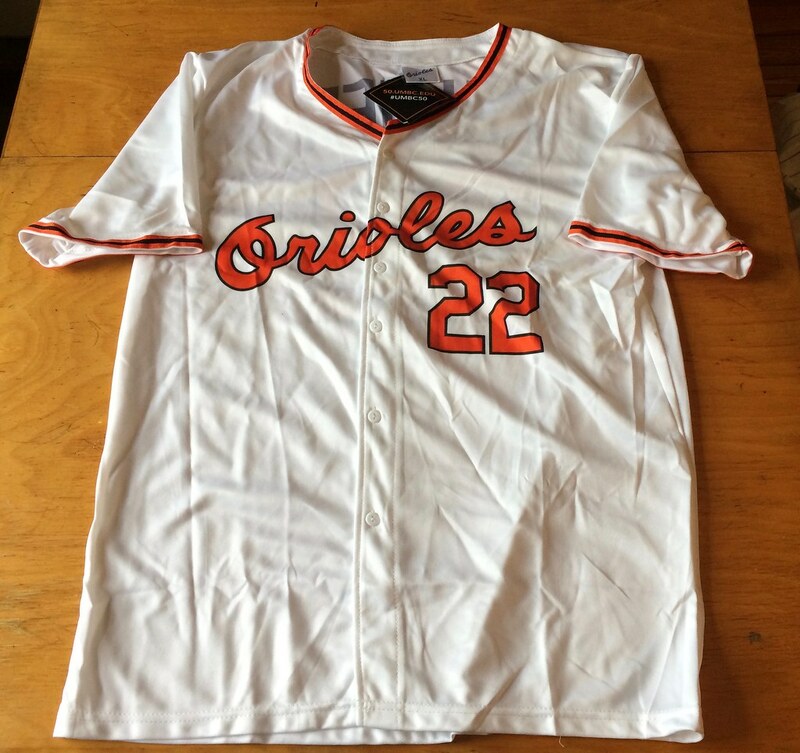 The link should work, but just in case: uniwatchraffle at gmail dot com. I’ll add that to the text as well. Alan Thicke was often involved in Hockey events–celebrity and otherwise (he WAS from Canada after all. He was friends with a lot of NHL stars. Here is at the 1987 (?) All Star Game. I’m pretty certain that is 1986 All Star Game. Appears to be Hartford Civic Center seats in the photo background. 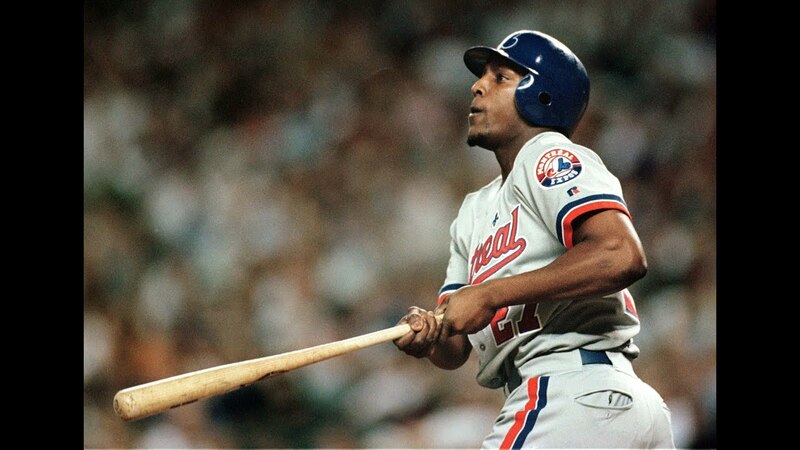 1987 had different All Star unis for Rendez-Vous ’87 against the Soviets. RIP to Mr. Thicke. Greatest TV sitcom dad. Overseas readers are welcome to enter. But if you win something heavy, I may ask you to chip in on the shipping expenses. I’ll add a note about that to the text. Jim Carrey doing Alan Thicke…. Jordan’s comment towards Rip Hamilton didn’t deter him from wearing his shoes much. He wore them most of career, if not all, and even in Chicago. Also, nice raffle prizes this year and if anyone has a pair of the American Trench Cardinals socks they’d like to sell…I wanted to get a pair for a friend for Christmas but they sold out in early November. I should have started my shopping earlier. I never claimed to have never written in my underwear; only said I didn’t write that passage in my underwear. As a note, in UK-English, pants = underwear. Makes for some interesting parsing in this exchange. In checking out that Moorhead Spuds article, it appears that the penalty was called against the Spuds’ opponent, leading to a Moorhead power play goal, not the other way around. The article doesn’t specify, but the game was played in Brainerd, whose fans were responsible for the potato tossing and subsequent penalty imposed against the home team. I hate, hate, I tell you, that cawledge hawkey hashtag/meme/whatever. I find it childish and off-putting. I’ve been watching college hockey for 35 years and it never needed a silly gimmick like that. I realize Buccigross loves hockey and embraces the college game, but this was not necessary. He’s a crummy play-by-play guy to boot. Anyone else notice that a lot of the “game used wallets” (giveaway 3) have old jerseys? A few that I noticed quickly were the Buffalo Bills, Florida Panthers, and Vancouver Canucks. Seattle color rush: I can find no other words than, “visually offensive”. The Rams throwback helmet is a waste with those tired uniforms they are wearing. They know what the fans want to see but for some reason won’t give it to them? Put their poor play on top of that and you can see why they are already having low attendance problems. The Saints went all out to give the fans a nice white throwback style color rush uniform and the Rams gave very little effort again. I agree with you. The only “new” feature of the Rams’ color rush uni’s are the white horn decals. We’ve seen the jersey and pants from them before. I guess it beats their “mustard soaked” yellow color rush unis…but that’s not a high bar that was set. The only “new” feature of the Rams’ color rush uni’s are the white horn decals. They know what the fans want to see but for some reason won’t give it to them? As has been explained many, many times, it simply was not possible for them to have a new uniform set for this season after they announced they were moving to L.A. Too much merch in the retail pipeline — takes about two years from art to part. For the full season, sure… for one color rush game? No. They could have easily worn the royal blue throwback jerseys that already exist. It doesn’t take 2 years for Nike to give them 60 pairs of plain royal blue pants. Oh, for sure, Jeff. But I thought — perhaps mistakenly — that the original commenter was talking about the big picture, not just tonight’s game. That’s what I am talking about @The Jeff, the Rams had a whole off season to come up with a good color rush uniform for tonight. 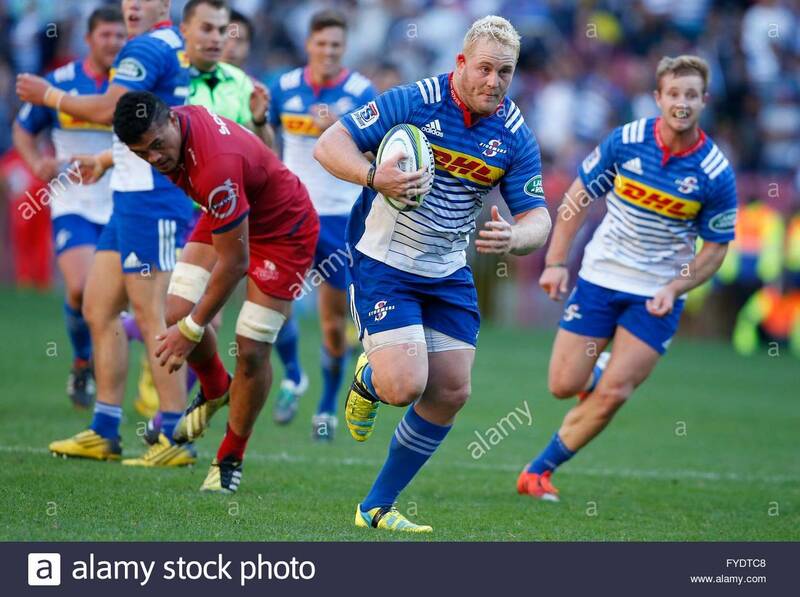 They could have easily got the royal blue pants with a thick white stripe, the opposite of what they wore in Gabrial era, that would have been fine. Or white pants with a thick blue stripe and just take the tacky gold off of the jerseys, they looked awful with the white and blue helmets tonight. Paul, I am talking about tonight’s game, the Saints did a great job of coming up with a throwback style jersey for their color rush game, the Rams just came up with garbage tonight. They could have easily had a white with blue horns jersey designed for tonight’s game to match the throwback helmet. Most of the other NFL teams came up with a good design, the Rams gave almost no effort, those jerseys looked like crap with those helmets, I was looking forward to seeing them tonight because I thought it was going to be something based on the 1972 uniform, they were a total letdown again. Most of the other NFL teams came up with a good design… I was looking forward to seeing them tonight because I thought it was going to be something based on the 1972 uniform. Actually, many other Thurs-night teams just wore their regular white uniforms this season (Browns, Falcons, etc.). The plan all along was for the Rams to wear their regular whites. I’m not defending it or saying it looked good; I’m just saying that there was no reason for you to have been surprised, or for you to have expected something different. The jerseys/pants they wore tonight were the ones they had been slated to wear all along. When I saw the white Ram horns on the helmet I thought they were going to come out with blue and white uniforms to match it? I guess I didn’t pay enough attention when the color rush uniforms were announced. With that said I also thought the Browns and Falcons looked bad too, the league hypes up the color rush games then brings in some pretty bad white uniforms. It’s more like boring rush! The NFL should take color rush and send it packing with pinktober, both are played out now. I would rather the NFL come out with Throwback Thursday games! where teams wear true throwback uniforms on Thursday night next season. I grew up in Los Angees rooting for two football teams – the Miami Dolphins (because I was born in Florida) and the LA Rams (because they were the home team). I have ALWAYS preferred the dark blue and white versions of the Rams jerseys to anything that has come afterward. For me, the two-color, high contrast, uniforms always felt more menacing/imposing than their later three-color combinations – the lighter blue, bright yellow and white version always felt too “bright and happy” for what was supposed to be (and, at the time, was) a physically violent sport. I wish the league would go back to their late 60’s/early 70’s – rules, uniforms, teams,everything! Hey you kids – get off my lawn!